Meaningful and Engaging Morning Work for K-2! • Morning Wake Up! Meaningful and Engaging Morning Work for K-2! 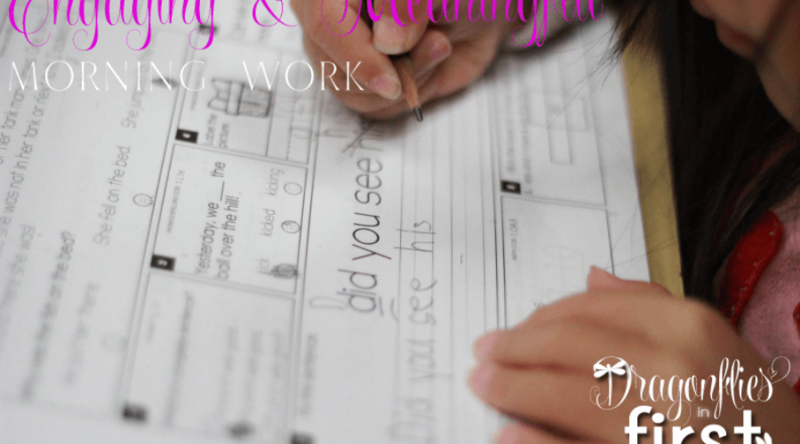 A while back I wrote about one of my favorite daily activities – MORNING WORK – and how I do it in my classroom. Check it out here: Does it Really Take 30 Minutes to Wake Up? I truly detest “busy work” but at the same time we need something for the kiddos to do that is review in nature while gently nudging them along to use that schema that we’ve been helping them master each and every day. AND, the simple truth is there are quite a few things that need to be taken care of in the morning and those little ones need to be busy so we can get it all done! provides ample time for practice. covers both ELA and Math. is all on one sheet. is always “familiar” in nature so little prior instruction is needed. follows a routine that is simple even when the concept is challenging. makes a significant difference in their concept mastery. As I wrote in Does it Really Take 30 Minutes to Wake Up, it’s the grading of this work that is important. I don’t collect it daily. In fact, we have our’s bound in books and in the kids’ desks. The kiddos grade it. They tell me the answers by telling me why the other answers were incorrect choices. We make this time meaningful. They work for about 10 to 15 minutes independently and then we work on explaining (or fixing) our answers for another 15 to 20 minutes. Check out that post to find out more about that. Here are some sample pages from our first grade Morning Wake Up book. The format stays the same. There isn’t a change in routine so we don’t waste time teaching how to do the page. Every once in a while a new concept comes in. I spend a few moments reviewing that concept before they start and then let them go. I’m so thrilled with their work and progress. They are so proud when it “clicks” and they can even attend to the challenges of something new without me telling them about it! I’ve been fortunate enough to work with the same friends for well over a decade. One of those friends teaches our school’s Kinder/1st combo class. She told me that Kinder truly needed their own Morning Wake Up. I was super excited to make that for them (and all you kinder teachers, too)! After all, if those Kinder’s master the standards through daily practice, they’ll show up at our first grade door next year all the more ready! Here are a few samples from Kindergarten’s year of Morning Wake Up. The depth and complexity build throughout the year. It starts with simple line and curve formations… moves on to letter and number identity and all the way through doing simple math and reading simple sentences! Another friend taught in first grade with me for FOREVER until she moved to 2nd. The only thing she missed in 2nd? Morning Wake Up. So I set off to make she and the rest of our 2nd grade team morning work that allowed their kiddos to master those 2nd grade skills. It has really worked out well for our 2nd grade team because those kiddos are used to doing this type of thing daily since they did it every day in first grade! So far I’ve completed units 1 and 2 for second grade. Unit 3 is underway. Essential Morning Work, Review and Depth of Knowledge Builders! Regardless of grade, each task has the standard it is addressing indicated right there on the page. This makes it that much easier to ensure you are “hitting the standards”. This makes admin and district personnel pretty happy too! These units also come with a TEACHER GUIDE that includes a “how to” as well as a scope and sequence. I absolutely love our morning work. I love that so many other teachers do, too! It has made such a huge impact with concept mastery with our primary kiddos! Morning Wake Up is a great way to ensure you have engaged kiddos right from the start of your day! MORE ON MORNING WAKE UP . . . The corresponding standard is indicated on each question in all levels of Morning Wake Up. The teacher’s manual includes a scope and sequence to help with planning and differentiation. Each grade level’s resource is available in 3 different units as well as money-saving bundles. You can check out a sample of it here. Kindergarten, 1st and 2nd grade teachers LOVE Morning Wake Up. I cannot say enough about how much I appreciate the wonderful comments I receive! It is beyond thrilling knowing Morning Wake Up is used and loved in so many amazing classrooms. ~I used these all last year and plan on using them for years in the future!!! I love how the kids “get” the format and how it builds over the course of the year!! It is perfect review and practice scaffolded to support first graders, thank you!!! ~This is the best morning work packet that I have found. I love that it is a spiral review of skills and that each section has the standard listed. Thank you for such an amazing product! ~This is one of the best packets I have ever bought. I love it! ~I absolutely love this resource!!!! It was hands down an amazing purchase! ~I LOVE this! My students do these each morning and they are becoming stronger students because of the skills practiced. Thanks! ~This is EXACTLY what I needed, especially because we have to have copies approved and they must include the standards, which you’ve already so thoughtfully included. Thank you for ALL of your hard work on this. ~Best money I’ve spent this year! This is on my firsties’ desks every morning when they come in! ~This is the best thing I have ever purchased on TPT. No more having to figure out what I am going to have my students work on first thing in the morning. I love the spiraling as it allows my students to work independently until a new concept is introduced. Thank you!!!!! ~This is a wonderful product. I highly recommend this morning work. All the students are able to come in and get started on their own. I review the page with the students self-correcting with red pen as you suggested . Perfect way to get the day started. Thank you! ~I love this morning work pack!! If you are looking for a great morning work pack, you have found it!! It is the perfect warm up to start our day! I love that it reviews so many skills each day!! I know there was a lot of hard work put into this high quality product!! Thanks so much for creating this packet. ~This is the BEST morning routine ever!! Even the parents love it!!! These are so awesome and perfect for getting our kiddos brains fired up in the morning! Love em! I love, love, love Morning Wake Up. Last year mid way into the school year, I purchased this and found it very effective. This year I began using it 2nd day of school and can't tell you how beneficial this is. My classroom Dibels score in Oct. was in the red. Dec. scores are now in the green. My students are able to tell me every sentence begins with a capital letter and ends with punctuation. My students have even begun to use exclamation marks in their writing. They work on this for 20 min. then we spend 10 min. correcting it. Thank you so much for creating this. I even got my daughter's first grade teacher to purchase her own set. Thank you so much for telling me about how well Morning Wake Up is working your classroom, Tami! It makes me so happy!! I'm glad your kiddos are doing so well! Yay! I'm SO thrilled! Thanks so much for sharing. After they get the "feel" of it, it is absolutely amazing how much true content and digging they can do on their own! I've never tried morning work, but this looks very intriguing. I'm impressed!